Pulau Ketam is an island at the mouth of the Klang River, near Port Klang, downstream from Kuala Lumpur. It host Chinese fishing villages comprising houses on stilts. 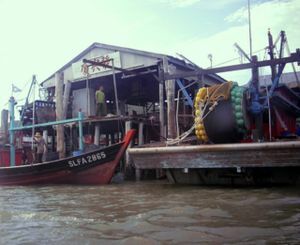 The settlement was established circa 1880 by mainly Teochew and Hoklo (Hokkien) Chinese fishermen. According to a local resident, the settlement experienced a population growth during World War II as Chinese from Taiwan fled the attacking Japanese and settled in Pulau Ketam. The buildings in the floating village are all propped up on stilts which extend up to 10 m below the water's surface. The streets, while appearing like normal paved roads, are similarly supported. Outside the main town, more precarious looking wooden bridges can be found. There are no cars on the island and getting around by bike is the norm, though there are a few motorbikes. Teochew, Hokkien and Mandarin Chinese are the main dialects spoken. Though English is commonly understood. The only way in is by boat from Port Klang.From Port Klang railway station, head across the tracks towards the water and look for the small ferry terminal to the left. - Alibaba Pulau Ketam Cruises Ferry services provider started operation since Oct 2016. Using high speed sight-seeing passenger boat which can accommodate more than 100 pax per trip, equipped with indoor air-cond cabin and open air sight-seeing upper deck. RM18 for return trip, RM10 for single trip. Standard Travel time 35 min, it may take longer during low tide. Services starts from 7:30am - 7:30pm during weekend and 7:30am - 6:30pm during weekday. - Air Cond Services There are about 15 ferries per day. The last boat from the island leaves at 5.30PM on weekdays and at 6PM on weekends. There are always speedboats on call that can be chartered at any time of the day or night. 40 min travel time, RM8 per trip. Refer to ferry image embedded. - Speed Boat RM10 per pax, 20 min travel time. Rent bikes for RM5 per day or take a boat trip. Mangrove, water, houses on stilts, fish markets. Wonder how a Chinese fishing village ended up in Malaysia. You can also visit a fish farm, walk along the planks looking at fish and have one for lunch. A traditional boat maker still makes wooden fishing boats and you can watch the progress, unless they just finished launching in which case you only see woodworking tools. Numerous temples dot the island and have paintings and murals dating back to presumably the founding of the island. Statues as well where the Monkey King features prominently. Despite only being accessible by boat the shops are reasonably priced and fairly well stocked, so don't worry about having to buy everything in KL beforehand. Seafood restaurants abound. There is also a variety of foods available. Disini juga disediakan hidangan babi golek dan kuah sos. Beer - the settlement is Chinese dominated, so drinking won't bring stares from conservative Muslims. There's at least two hotels both offer bicycles to rent. Prices are a lot cheaper than in KL. Take boat trips around the islands, though boat back to Port Klang is the only way to leave. This page was last edited on 24 February 2017, at 07:01.